During his acceptance speech early Wednesday morning, President Barack Obama promised that he’d “fix” the absurdly long lines we saw at polling places in states like Ohio, Virginia, and Florida—up to seven hours, in some cases. As they are wont to do, tech evangelists are suggesting all kinds of whiz-bang solutions: In 2020, we’ll all be voting on Facebook! But long lines aren’t a new problem. A decade after Congress passed landmark legislation to smooth out the process, the same issue keeps cropping up. And election experts are mighty skeptical of technological fixes. Take touchscreens, for example. After Florida’s “chad” fiasco in 2000, the machines were supposed to make voting simpler and more secure. Spurred by the Help America Vote Act in 2002, jurisdictions spent tens of millions of dollars on them. But they have actually worsened the line problem, since each one can only handle one voter at a time. And they’re less reliable, because without a paper trail, there’s no way to make sure votes were accurately recorded (which they sometimes aren’t). According to Alex Shvartsman, director of the University of Connecticut’s Center for Voting Technology Research, $1 billion worth of touchscreen machines have been scrapped for those reasons, and the paper ballot is back in style: Hundreds of people can fill them out at once in a given polling place, and a handful of optical scan machines can tabulate them at lightning speed. If something goes wrong, you can always count the ballots by hand. Experts foresee similar problems with tech efficiencies like voting by email—New Jersey’s ill-fated experiment, even given the extenuating circumstances, doesn’t inspire confidence—and submitting your ballot, Square-style, with a smartphone. Shvartzman even worries that would lead to rampant fraud, since you could provide a prospective vote-buyer with a “receipt” that proves you checked the right boxes (doing so by photographing your ballot is often illegal). But why can’t we vote online like we bank online? Well, banks invest a lot more in security, and still lose millions of dollars every year to Internet theft. That’s the kind of margin for error that could end up swinging an election. That doesn’t mean there aren’t ways to modernize parts of the process besides the actual casting of ballots. Larry Norden of the Brennan Center for Justice says registering people to vote on paper creates all kinds of errors and delays. That part should happen electronically, and perhaps even automatically at the DMV. 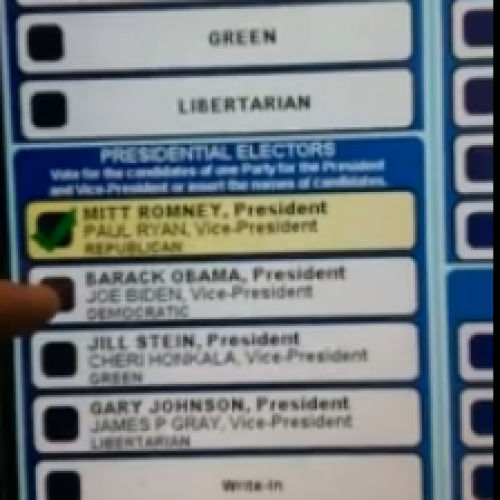 People can then be checked in to the polls with an iPad. The relatively minor investment pays for itself in savings on paper. Norden also proposes an online election information clearinghouse, which would allow a county in Oklahoma to learn about a problem with a voting machine in New York, and be ready for it. But to really make sure voters get in and out in reasonably good time, you’ve got to do two basic things: Expand capacity at the polls, and the time that people have to use them. After all, the worst queueing situations cropped up in counties where polling places had been consolidated, or early voting days had been curtailed either for budgetary or political reasons. And sure, it’s not cheap to keep them operating for weeks on end, or pay more people to staff them. But early voting in particular holds the biggest promise for avoiding the election-day crush. So what should Obama do to keep his promise? First of all, he should actually fill seats on the government body meant to deal with these problems—the Election Assistance Commission—which he’s thus far entirely neglected. They could establish new guidelines for what systems should be in place at every polling location, and set up the national online clearinghouse for election-related issues. He should also fund grants to pay the modest up-front costs of modernizing voter registration, and to help cash-strapped counties trying to keep more polling places open longer. As it happens, Congress is already trying to do its part. In May, Georgia’s Rep. John Lewis introduced a comprehensive bill that would require online registration and institute minimum time frames for early voting and absentee ballots, so they can’t be tampered with for partisan ends. Democracy is a machine: You need to oil the gears and replace the parts, not re-engineer the whole thing every four years. This year, election officials failed to knock off the rust, and shouldn’t forget to do so again.